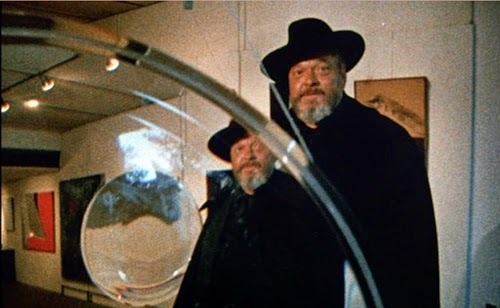 Cleveland Cinematheque director John Ewing is presenting the following series at the Cleveland Museum of Art in honor of the 2015 Orson Welles Centenary. The series opens on Sun., Jan. 11 with CITIZEN KANE. All films will show in the art museum’s Morley Lecture Hall. Born in 1915 in Kenosha, Wisconsin, producer/director/writer/actor Orson Welles revolutionized movies, radio, and the theatre. One hundred years later, he remains a larger-than-life figure who is still regarded by many as the greatest film director who ever lived. We commemorate his centennial year with five of his best known masterpieces, all projected from 35mm film. Special admission to each film is $10; CMA members, seniors 65 & over, students $8; no vouchers or passes. Sunday, January 11, 1:30. Wednesday, January 14, 6:45. Directed by Orson Welles. Welles’ film directorial debut is a fun, flamboyant account of the rise and fall of a mysterious newspaper tycoon. Long voted the greatest movie of all time. Cleveland premiere. USA, 1941, b&w, 35mm, 119 min. Wednesday, January 21, 7:00. Friday, January 23, 7:00. Directed by Orson Welles. With Tim Holt, Joseph Cotten, and Agnes Moorehead. Welles’ sublime follow-up to Citizen Kane is a lyrical, poignant account of the decline of a great Midwestern family at the turn of the 20th century. Music by Bernard Herrmann. USA, 1942, b&w, Blu-ray, 88 min. Friday, January 30, 7:00. Sunday, February 1, 1:30. Directed by Orson Welles. With Welles, Rita Hayworth, and Everett Sloane. In this head-spinning film noir, an Irish adventurer becomes a pawn in an elaborate murder scheme involving a lawyer and his blindingly beautiful wife. USA, 1948, b&w, 35mm, 87 min. Sunday, February 8, 1:30. Wednesday, February 11, 6:45. Directed by Orson Welles. With Charlton Heston, Janet Leigh, and Welles. A corrupt, corpulent cop locks horns with a Mexican narcotics agent in this lurid tale of drugs, kidnapping, and murder in a sleazy American border town. 1998 restoration. USA, 1958/98, b&w, 35mm, 112 min. Wednesday, February 25, 7:00. Friday, February 27, 7:00. Directed by Orson Welles. This dazzling, dizzying discourse on fakes, forgeries, and frauds from a master of legerdemain encompasses Elmyr de Hory’s masterful faux paintings, Clifford Irving’s hoax biography of Howard Hughes, and Welles’ own War of the Worlds broadcast. France/Iran/W. Germany, 1975, color, 35mm, 85 min.